Today, however, it’s Antonella’s mom who is being treated — for malnutrition, a state-inflicted malady that is sweeping across oil-rich Venezuela. Struggling to feed herself and her child, she fainted when she walked into the hospital where Antonella is slowly dying. The trips are becoming less frequent as the hospital struggles to restock the drugs Antonella needs. Medicine is just one of a long laundry list of essential supplies that the country, gripped by a political and humanitarian crisis, is lacking. Doctors at Domingo Luciani depend on donations to feed their patients. Electricity at the hospital is intermittent, and the pharmacy is almost empty. Absent too is the familiar odor of disinfectant — there’s none left. Official figures on the shortfall of medicine are difficult to come by, and facilities like these are kept under strict surveillance to keep it that way. Entrances are patrolled by members of the feared national police, or, even worse, FAES special forces units. Security staff keep a detailed log of visitors, checking each bag, and there are said to be informants on every floor. “Hospitals are guarded by the military … by the government, who puts the military there so it can control the donations that come in,” said Giselle, a volunteer working with Comparte Por Una Vida, a nongovernmental organization that provides supplies donated from around the world. Malnutrition is a condition that had rarely been seen in Venezuela before 2014, when a combination of mismanaged government funds and the plummeting price of oil drove the country into an economic meltdown. Now it’s a fact of life for many. 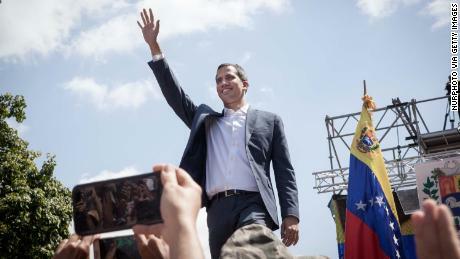 While the Venezuelan government has denied any crisis exists, a university study published last February found that 87% of Venezuelans were living in poverty. 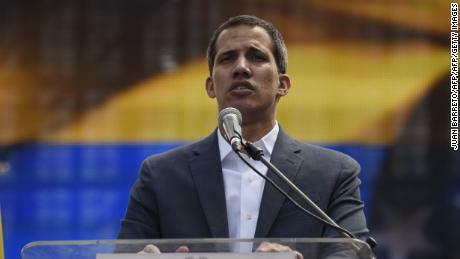 Venezuelan opposition leader Juan Guaido declared himself acting president last month and has been working with a raft of global partners to bring humanitarian aid into the country. 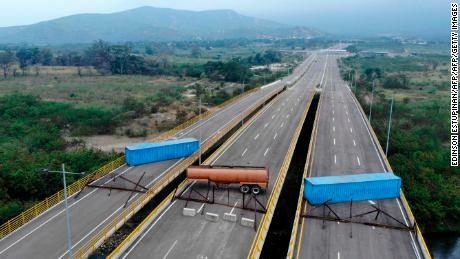 But Maduro has repeatedly refused assistance in the face of growing food and medicine shortages. Established in 2016 as the humanitarian situation worsened, Comparte Por Una Vida now works with 35 public hospitals, as well as schools and orphanages all over Venezuela. It has collection centers in most neighboring countries, and a large portion of donations come from the United States. On this visit to Domingo Luciani hospital, they’re delivering diapers, protein bars and powder, baby food and powdered milk. “Parents don’t have enough money to cover the necessities of the kids,” Giselle said, explaining that volunteers have to repack some items individually to discourage recipients from reselling them. A senior doctor, who goes by Jane to protect her real identity, said the donations make a huge difference. The spaces are desperately needed. 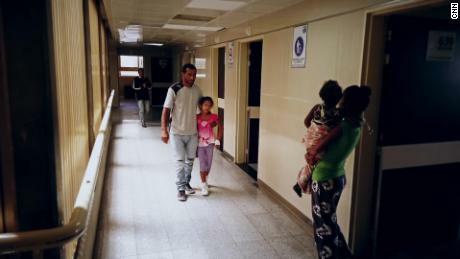 Domingo Luciani is the last hospital in Caracas with a functioning pediatric surgical unit; of its 18 operating rooms, only three are still in use. There are 500 children on the waiting list in the capital alone, Jane said, and waiting times for surgery can quickly be pushed from several weeks to several months. A survey of 104 health facilities in Venezuela, commission by the opposition-led National Assembly last year, revealed that most laboratory services and hospital nutrition services are intermittent or completely inoperative. At the time of the study, 14% of intensive care units (ICUs) had been shuttered because they were unable to operate — and the vast majority of open intensive care units had intermittent failures due to a lack of supplies. Almost a quarter of pediatric ICUs were closed. “The government doesn’t supply all of what should be in hospitals so you need a lot of institutions, a lot of NGOs, a lot of people to bring outside donations so they can cover a very small percentage of needs,” Giselle said. Room after room in the hospital is filled with anxious parents waiting to find out if there’s enough medicine left to help their children. 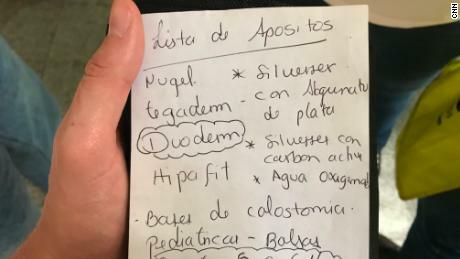 As the Comparte Por Una Vida volunteers left the hospital, a junior doctor quickly jotted down a list of needed supplies, including colostomy bags, a gel to treat wounds and burns, dressings for wounds and surgical gloves. “We end up splitting dressings and bandages in two or more to maximize their use and to treat more than one patient,” the doctor said. Next article2019: Which way will S/East go?